Japan is one of the most advanced and modern countries in the world in so many things, but as for the use of electronic payments, it is still far behind other developed countries. Cash in Japan is widely used and it is practically impossible to live without it. If you are about to travel to Japan, then you must think about how to exchange your money in the local currency, the Japanese yen. It is quite difficult to give a general advice valid for the whole world. Exchanging foreign currency for yen in Japan, unlike what you might think, can be quite convenient. However, as already mentioned, there are big differences depending on the currency you want to change. Euros and American Dollars are the cheapest to exchange in Japan. Other currencies are more expensive for sure and in some cases super expensive. In Japan you can exchange foreign currency for yen mainly in banks, post offices, moneychangers and in kinken shops. It is not recommended to exchange money in banks and post offices unless you are in the countryside or small towns where no other option is available. The procedure is often complicated, the employees could be busy doing something else and almost certainly don't speak English, and the commissions are not even cheaper than the average. Some branches may also not provide this service. The most important banks that generally offer the currency exchange service are MUFJ, SMBC and Mizuho, often through offices dedicated exclusively to currency exchange that you can find at airports and in various other tourist locations. Rather than entering a bank branch at random, look for one of these dedicated offices. In recent years, automatic currency exchange machines are becoming more and more popular, as the machines are generally in use 24 hours a day and English and other foreign languages are available. You can find them in places for tourists, such as airports, large railway stations, big hotels, shopping centers and even in some konbini. Kinken shops (金券ショップ kinken shoppu) are a particular type of shop that buys and resells tickets and goods of all kinds. In these stores you can buy shinkansen tickets and other train tickets, passes, season tickets, discounted tickets, coupons, concert tickets and other miscellaneous events at lower prices than their original price. This is because someone who owned such tickets and who for personal reasons could no longer use them, went to resell them at one of these stores. In recent years, some of these stores, particularly those in the vicinity of large stations in tourist areas, have also begun to offer currency exchange. The biggest kinken shop chains that also provide currency exchange are Daikokuya in the Tokyo area and Tokai in the Kansai region (Osaka and Kyoto). Withdrawing cash directly from your credit, debit or prepaid card is a simple, fast and often cheap solution. But you must pay attention to a number of things. First of all, you must have a card that can be used abroad (it would also be better to have two of them, in case some problems should occur with the first one). Then, you need to check that your card contract does not include too expensive conditions and fees for withdrawals abroad. All the major Japanese airports have ATMs working with international cards as well as numerous currency exchange counters. In the main airports (Tokyo Haneda, Tokyo Narita, Osaka Kansai) you will find dozens of different currency exchange offices. As soon as you arrive in the arrivals area of the airport you will immediately find see some of them in front of you, others are scattered around the airport. However, the exchange rates of the different counters are very similar to each other, so it is not worth going around to look for a better exchange rate. Exchange rates at Tokyo and Osaka airports are generally quite fair for euros and dollars, very expensive for other currencies. You can check online the daily exchange rates at Tokyo Narita and Osaka Kansai. In order to understand if an exchange rate is good or bad, you have to compare it with the exchange rate that can change every second of the day on the world financial markets. Obviously it will be impossible to obtain a rate which is exactly equal to that of the market, because whoever is offering you the service must get something out of his business. For this reason, the exchange rate offered is generally a few yen lower than the market rate. The euro-yen exchangerate, updated to 18-04-2019, is equal to 1 euro = 125.86 yen. 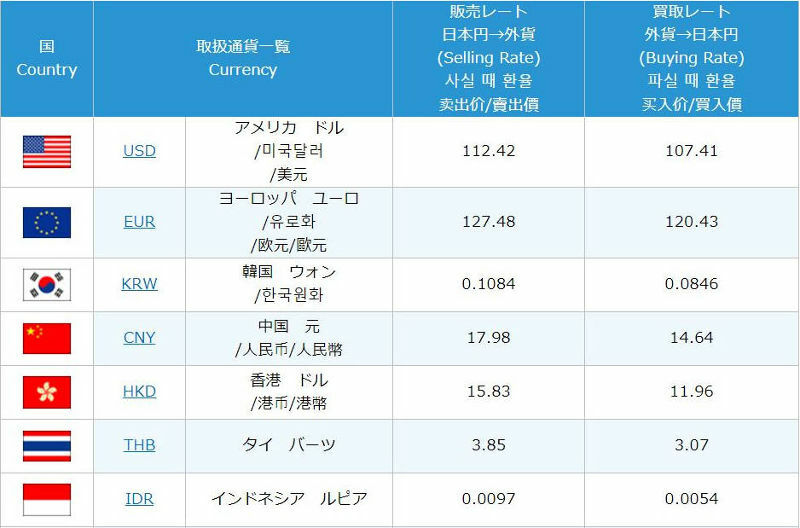 is a very good exchange rate if it is higher than 1 euro = 122.50, that you can only find in the best currency exchanges in Japan. is a fair exchange rate if between 1 euro = 120.00 and 1 euro = 122.50. It is not at all difficult to find these rates in Japan. is a bad exchange rate if it is lower than 1 euro = 120.00. You can do better than this. Even if you are not aware of the latest official exchange rate on the financial markets, you can approximately find out how convenient a currency exchange rate is by using a simple technique. As you can see in the example pic below, a currency exchange store always displays two prices for each currency, a sell price and a buy price. The first price is for those who want to buy foreign currency by paying it in yen (for example Japanese people leaving for foreign countries), the second price refers to those who want to buy yen by paying them in their currency (for example tourists arriving in Japan). The official exchange rate, even if you don't know it, can be estimated by knowing that it is generally in the middle between these two buy and sell prices. The larger the difference between buy and sell prices, the more inconvenient is the exchange rate applied by that shop.